This is my personal blog specialising in travel and bellringing but with the occasional post on some topic that interests me. I have just returned from a long weekend in Barcelona. Both my wife and I have been before but not together and it seemed like a nice destination for an bit of Autumn sunshine. The trouble is I'm not a fan of crowds and the main tourist areas of Barcelona are heaving! Las Ramblas is a popular part of the City but in the main streets and squares you can hardly move. There are some quieter squares where you could manage to swing a small cat and some obscure alleys that have some small and reasonably priced cafè and bars. The city beaches were very good though I imagine that they too would be busy in the summer months. 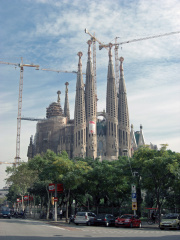 On my previous visit to Barcelona I only saw Sagrada Família from the outside and was not impressed. I was prevailed upon to visit again and we had to queue for ages to gain entrance. Ok, I have to admit that the queueing was worth it, the inside is spectacular! The inside was very busy getting ready for a consecration service to be performed by Pope Benedict XVI on 7th November. 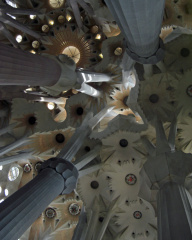 It is hard to believe that the outside and inside of Sagrada Família were designed by the same person, i.e. Antoni Gaudí. While the outside looks like it has been fashioned by toddlers playing with mud, the inside is a beautiful forest of supporting columns that branch like trees supporting the roof, elegant spiral staircases and stained glass. Since I am averse to crowds, particularly crowds of tourists, we stayed at NH Cóndor on Via Augusta, just a couple of km walk, or a short bus ride, from Plaza Catalunya. There were several small establishments nearby for variety at breakfast or an evening meal and all but one were good. One of the rudest waiters it has ever been my misfortune to encounter worked at Tris Tras on the corner of Plaça Molina. However, to balance the scales, we had superb service a little farther along Via Augusta at Bar Maria Castaña. 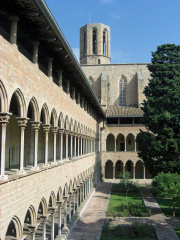 We ventured a bit father inland and visited Monestir de Pedralbes which was founded by Queen Elisenda de Montcada in 1327 and occupied by Poor Clare Sisters. 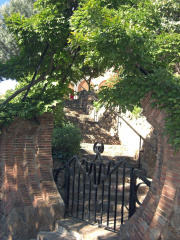 It is set in the hills overlooking Barcelona and the sea and since 1983 it has been a museum open to the public. It is a nice peaceful place but not as big as I had anticipated, it mostly consists of the three storied cloisters surrounding the garden, part of which is given over to medicinal plants. The Church of Pedralbes adjoins the Monastery but a service was in progress when we arrived and it was closed when we left so no idea what it is like inside. We had left a trip to the Dalí Theatre-Museum in Figueres until Monday in the event of inclement weather, unfortunately it is closed on Mondays, fortunately we learned this before taking the two hour trip. So for our final point of call we visited Park Güell, another Gaudí related place in the hills of the Gràcia district above Barcelona. The park entrance is flanked by two Disneyesque buildings which opens on to the Monumental Core, an ornate structure that was crowded with people. I have come to the conclusion that I do not like most of Gaudi's work! We enjoyed exploring the more peaceful wooded hills that form the bulk of Park Güell. In the hills we visited the Casa Museu Gaudí, which was the home of Antoni Gaudí, it is not very big and not a terribly good museum. I know that when it comes to some aspects of culture I am a bit of a Philistine but I still enjoyed my trip to Barcelona and the inside of the Sagrada Família left me with the view that Antoni Gaudí isn't a complete waste of time.